Veritas: A bit of climbing. _MAL1099.jpg, originally uploaded by Michael A. Lowry. I have been doing a lot of climbing lately. Tuesday, Thursday, Friday, and Saturday, I climbed indoors at Klättercentret. Friday evening, Linda H. and I climbed some tricky routes at KC. We both managed to make our way up a very challenging 7a-graded route on the left side of the tall climbing wall. That was the first time I had attempted a 7a. A bit later, I struggled up a 7b too. Yay! 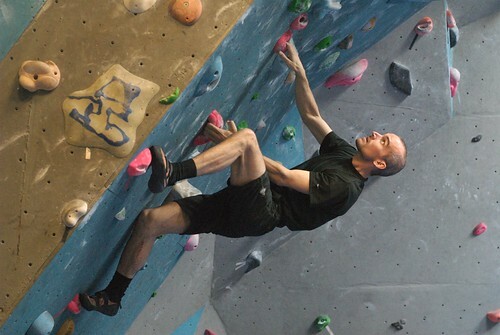 Anna F. took this great photo of me tackling a red-graded bouldering problem on Saturday afternoon. After Anna left for work, I tried the tricky 7a from the day before. With Kjell's help and encouragement, I did it again, even more smoothly and quickly than the first time. We took 50 photos in all on Saturday. Take a look!